Christina Elliott Sorum, suffered an unexpected cardiac arrest on May 12, 2005 and died in Ellis Hospital in Schenectady, N.Y. on May 16, 2005. She was 61 years old. Christie was the Frank Bailey Professor of Classics, Dean of the Faculty and vice president for Academic Affairs at Union College. She grew up in Jacksonville, Ill., attended Wellesley College and Brown University, started the Classics program at North Carolina State University in 1975 and moved to Schenectady in 1982 to become Chair of the Classics Department at Union College. In addition to writing innovative articles on Greek tragedy, Christie was a beloved and prize winning teacher, a superb administrator and a nationally recognized advocate of liberal arts education. She loved books, dogs, classics, students and Union College. As chair of classics until 1994, on faculty committees, as Dean of Arts and Sciences from 1994-99 and finally as Dean of the Faculty, she worked tirelessly for the students, faculty and staff of Union College. Christie is survived by her husband, Paul Sorum of Schenectady; their daughter, Eve Christina Sorum of Boston; her brother, Jeff Elliott of Council Bluffs, Iowa; her dog, Hector. A Memorial service will be held at the Union College Memorial Chapel on Thursday afternoon, May 19 at 3:30 p.m. Memorial contributions may be made to Union College, Schenectady, N.Y.; to Planned Parenthood or to your local animal protection center. Arrangements by the Daly Funeral Home, Inc.
Christina E. Sorum, dean of faculty and a strong champion for Union's distinctive broad education, undergraduate research and international study, died early Monday morning after suffering a heart attack on Friday. "As a college and community, we are devastated,” said President Roger Hull in an announcement to the campus community. “While words at times like this always seem meaningless, I know that Union is better because of Christie’s contributions. As a colleague, teacher, scholar, mentor and friend, she had an impact on many, many people over the years." A memorial service will be on Thursday, May 19, at 3:30 p.m. in Memorial Chapel. A reception will follow in Hale House Dining Room. Survivors include her husband, Paul; and daughter, Eve. A native of Jacksonville, Ill., Sorum graduated from Wellesley College with honors in Greek and received a Ph.D. from Brown University (her dissertation was "Monsters and the Family: A Study of Sophocles' Trachiniae"). 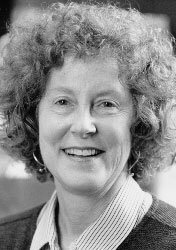 She was a visiting instructor at Union in 1973-1974, became an assistant professor at North Carolina State University, and returned to Union in 1982 as an associate professor and chair of the Department of Classics. She became the Frank Bailey Professor in 1992. She was named dean of arts and sciences in 1994, and acting dean of faculty in 1999. She was named dean of faculty and vice president of academic affairs in 2000. Christie, as she was known throughout campus, served the College in a variety of administrative capacities including department chair, and a member of the General Education Board, Faculty Review Board, Academic Affairs Council and numerous tenure and review committees. She wrote extensively for both classics journals and academic administrative journals. She was a featured scholar in a History Channel program titled "Gods and Goddesses." She wrote, with Tom Werner, Florence B. Sherwood Professor of Physical Sciences, an article, "Enriching Undergraduate Research and Scholarly Activity Opportunities in All Disciplines at Union College" which appeared in the June 2003 issue of the Council on Undergraduate Research Quarterly. In an interview shortly after her appointment as dean, she said that one of her chief goals would be to continue to improve what the College does extraordinarily well -- undergraduate research and international study. "Those experiences are the most transformative for both the personal and intellectual development of students, and they provide some of the best preparation for life after college -- how to learn on your own, how to deal with difference," she said. She was also a strong advocate for the College's investment in arts and engineering. "Participation in the arts ought to be available to every student," she said. "Few things are more rewarding after college than having an active interest in, and participating in, the arts." Given engineering's strong tradition at Union, she said, "we need to ensure excellence. I want to continue to work with the dean of engineering and the rest of campus to discover the proper role of engineering on a liberal arts campus -- how it can enrich the rest of the College, and how the rest of the College can enrich engineering." She said the College must continue to pay attention to the "more traditional" elements of education -- communication skills, quantitative skills, a grasp of the elements that comprise the culture from which we came -- and pay increased attention to academic and career advising. Other topics of great interest to her were enhancing the diversity of students and faculty, continuing to develop innovative ways to link the residential and intellectual life on campus, and revisiting the College's general education program. Fundamental to all these objectives, she said, is an excellent faculty. "We no longer have a world where we can have our pick of faculty," she said. "The overabundance of Ph.D.s from the 1970s and 1980s is gone. We have to be competitive in hiring, and we have to provide our faculty with the full opportunity to develop as teachers and scholars. "Although we pride ourselves on our emphasis on teaching, I believe that faculty enthusiasm for teaching comes from being absorbed in a discipline," she said. "I believe that having faculty active in a scholarly way is even more important at a small college than a large university. It's so easy to become intellectually isolated at a small place, where you may be the only faculty member teaching in a particular area. Faculty must participate in their disciplines outside the walls of the College, and we must provide the opportunity for them to do good scholarship and research." At the opening faculty meeting last fall, Sorum called on her colleagues to enhance interdepartmental programs through better coordination and focused hiring, and to reach a timely resolution for the reshaping of the General Education program. She cited the 2000 Middle States review, which said, "With four divisions and a 200-year tradition of 'union' learning, the potential for cross-disciplinary work at this College is considerable." Sorum said the College has a belief in the value of a broad education, as demonstrated by programs such as Latin American and Caribbean Studies, Bioengineering, East Asian Studies and GenEd. The prominence of Converging Technologies (also known as Converging Thought) is an important step, she said. "I will be working this year with departments and with the Academic Affairs Council to ensure that our various programs are taken into account in the hiring process and in curriculum development," she said. "The fact that we have 195 ID majors and 258 students doing minors indicates that a considerable number of our students are interested in a broad education." On GenEd, Sorum last fall asked her colleagues to "think of the students and what is essential to their education." With Sorum, the faculty have spent much of the last academic year revising GenEd. GenEd, she said, "is a curricular statement of what we think a liberal arts education must include. All types of schools have majors. We as a liberal arts college define ourselves not by our majors but by the broad learning we wish our students to gain." Sorum last fall asked senior faculty to work closely with newer members to include them in the intellectual community, a recommendation from the Middle States report. The Minerva Houses and a nascent faculty lounge will provide venues, but they are not sufficient, she said. "We who have been here many years are the ones who must step forward and nurture the redevelopment of an inclusive community," she said. "We have much to offer the newer members, and they have much to offer us." Sorum also was not shy about asking her colleagues to put modesty aside for the sake of the College. In typical humor, she once sent an e-mail urging faculty to "lay aside your normal reticence and senses of propriety" and to alert the Office of Communications when "you publish something, give a talk, win a grant, stage a performance or do anything that is a professional accomplishment. "This is all a part of the campaign to ensure that the world knows what we do when we aren't in the classroom, to raise our College's academic reputation, to increase opportunities for funding, etc.," Sorum wrote. "It is not just another imposition on your sensibilities or your time; it is important for the future of Union." She concluded: "I write as a reformed sinner."